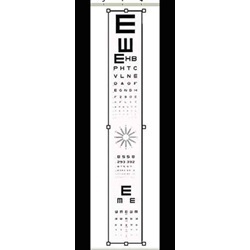 Letter Acuity, Astigmatism Clock, Number Acuity, and Tumbling "E"
The astigmatism acuity projector slide is ideal for any age. Slides contains letters, tumbling "E", astigmatism clock, and and number acuity. Made of high quality photographic film, sealed between two pieces of glass. Manufactured by Stereo Optical. Comes as singles.